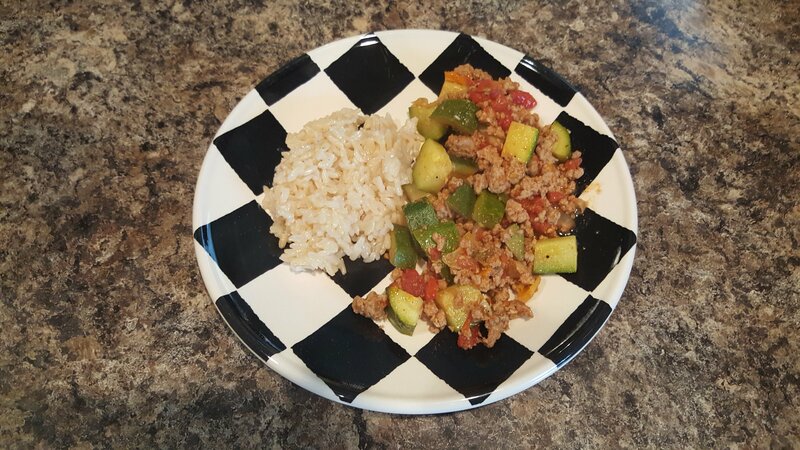 Week nights are busy with homework & dance activities, so quick, healthy, and easy dinners are always great to have ready for my family! Brown ground turkey, onion, and bell pepper over medium heat until meat is browned. Add minced garlic, tomatoes, and spices. Stir well and cover. Simmer over low heat for 10 minutes. Add zuchinni. Stir well and cover. Simmer for another 10 minutes. Don’t over cook zucchini. Should be fork tender, but still firm. Serve as is or with brown rice or another veggie. Reheats well for lunch the next day. If you prefer more heat you can use 2 10oz cans of rotel or spicy salsa in the place of diced tomatoes. I don’t cook red meat, but you could substitute with lean beef. This is a quick 30 minute low carb meal! This could be easily switched to an instant pot meal. Would also be good with zucchini & squash. I love finding recipes and putting my own twist on them. So I especially love recipes as versatile as this one. So many twist can be put on it to make it your own favorite or just what you have on hand at the time. I often shop the bulk isle at our local grocery store and was able to find almost everything I needed on that one isle. Bake between 300°-350° (depending on your oven. I bake it at 300°) until golden. Stir it after 15 minutes. Then every 10 minutes to follow. It only takes 25 minutes in our oven. It will crisp as it cools. 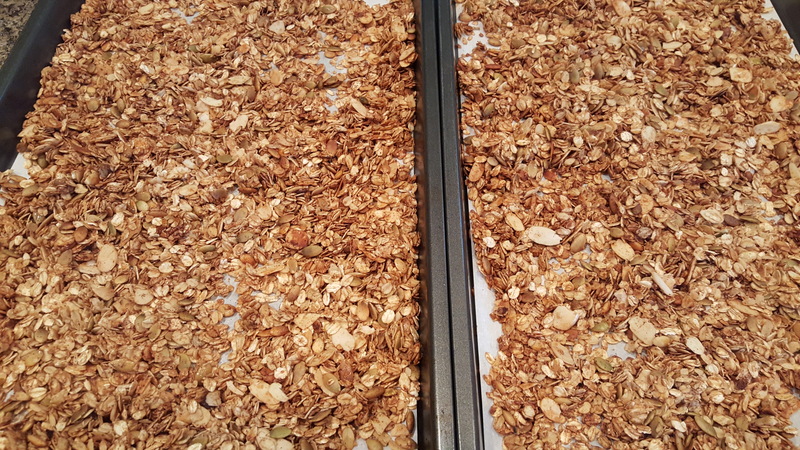 Allow it to dry completely and store in an airtight container for up to 3 weeks. 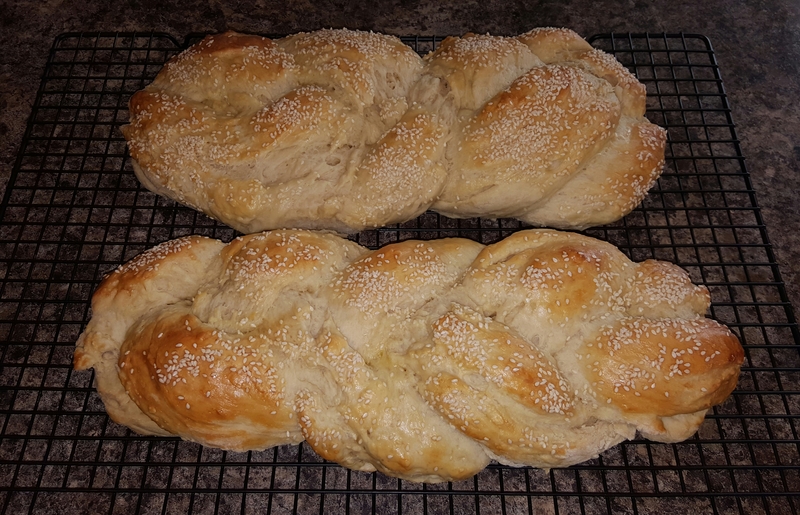 Can’t say I’ve knowingly baked a Jewish bread until this one. Also can’t say I’ve baked a bread that tasted better! Our lil monsters flipped over it. I guess it’s a good thing I decided to bake two loaves the first time. It was a very simple bread to make that looks far more difficult than it was to bake. In a gallon ziplock bag, add the yeast, water, sugar, salt, oil, and 3 cups of flour. Give the bag a little shake. Don’t work too hard. Remember it’s a lazy Challah! Place the bag in a bow of warm water for 30 minutes. Remove from bowl. Shake, release air from the bag. And place on the table or coutnertop for 1 hour. Flip the bag every 20 minutes throughout this hour. The dough should be very wet. It will start to bubble and self knead. After the 1 hour, add 1/4 cup flour and give the bag another shake. This makes the dough not stick to the bag. Leave the bag for 1 hour and 30 minutes to rise. It should still be a wet dough. If it’s not rising, flip it over and knock it down. If the dough is wet, the recipe will turn out amazing. On a well floured surface, separate the dough into three sections and stretch them out to braid. Baste with egg (or optional olive oil) and sprinkle with sesame seeds. Leave to rise for 15 minutes before it goes in the oven. Bake on a nonstick tray for 40 minutes or until golden brown on top. It’s a very easy bread to bake, however it’s a little process. So I’ll likely make two loaves each time and freeze one. It’s a bit of a heavy bread, but I can’t stress how much our children loved it! 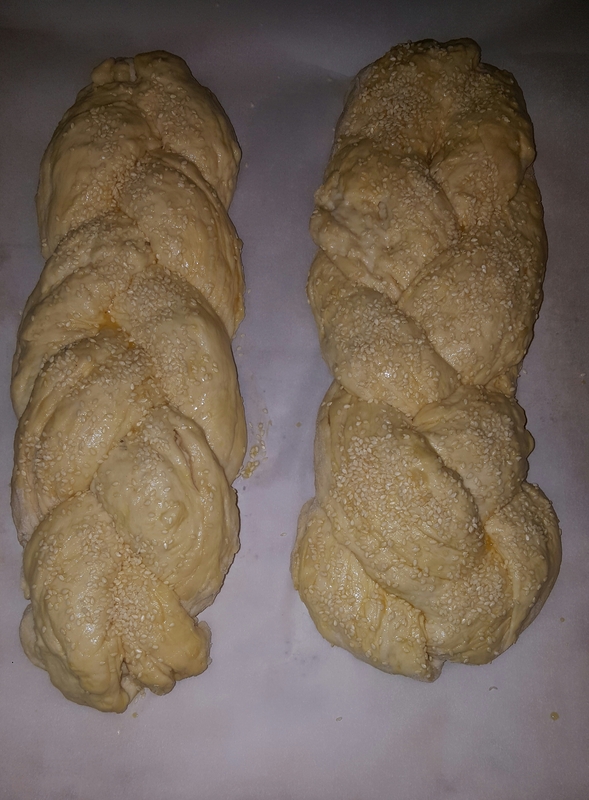 When braiding the bread sort of fold the ends under. 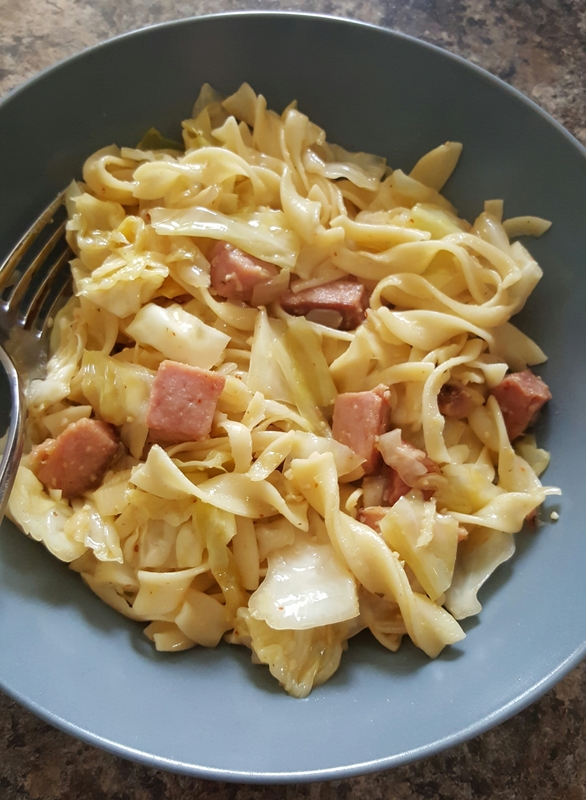 This time of year I always find I’m scouring the internet for new cabbage recipes, because well this is what happens when you leave the Irish Italian Islenos parade with countless heads of cabbage. A friend recently shared this one and I had to give it a try. Our family loved it and it will definitely be a repeat. This was the first Polish dish I’ve ever made! In a large skillet, Over medium high heat, cook the ham in 3tbsp butter until the ham starts to slightly brown. About 1-2 minutes. Add 2 tbsp butter to the pan then add the garlic and onions to sauté another 2 minutes or so. Add the cabbage, oil, and salt. Mix then cover, reduce head to medium for 8-10 minutes. Meanwhile, cook the noodles according to the package and drain. Once the cabbage mixture is tender add the noodles. Add the remaining butter and cook for about another two minutes. You can use any type of noodles you’d like. I’m sure I’ll always use the egg noodles because we like the consistency. You can also replace the ham with bacon, kielbasa, sausage, etc. The recipe called for white and black pepper as well. I only cook with pepper when it involves lemon pepper, so I opted to not use it. I also used a little garlic onion seasoning blend and cajun seasoning. I’m not sure that I know anyone that cooks with “1 clove of minced garlic”, if that’s your thing, by all means go for it. We however cook with a lot of garlic around here. Not sure I’d freeze these left overs, but it was delicious for lunch the next day.